Urban audiences accustomed to purchasing their dinner fixings in cellophane-wrapped packages have no trouble recognizing the table dressings, but the Goodman Theatre's grocery list also includes raw ingredients like the famous turkey as big as the boy sent to fetch it from the butcher's shop, as well as an outdoor-market vendor's display of freshly-slaughtered geese for sale to Christmas Eve shoppers. "Good realistic animal props are hard to find and extremely expensive to rent," says Goodman property supervisor Alice Maguire, "Our turkey and geese were built in our own shop thirteen years ago. It took about three weeks and cost about $300 for the turkey and $75 for each of the geese, covering materials and labor." The custom-made geese started with hard-foam bodies from a taxidermy supply house, along with heads and bills purchased separately, explains Maguire. After these were covered with poly-fleece "down," rope necks and metal feet were attached and feather pads glued on. The turkey, by contrast, was hand-carved from the same foam and decorated with feathers purchased separately. ("You can buy sets with just the turkey tail and wings by themselves.") To increase the length to the requisite "twice the size of Tiny Tim," the head and body were connected by individually-cut feathers affixed to a length of spandex-covered hose. It's not over yet, however. The play's action not only mandates that these birds be seen, but transported as well. Wrapping rope around the feet of the geese allows them to be strung along the sides of the poulterer's wagon, but the turkey must be wheeled in on a dolly-truck at posthaste speed (in compliance with Scrooge's exhortation, "Come back in less than five minutes and I'll give you half a crown!"). When the boy playing the role that year is small enough to stand next to the prize gobbler, the latter is tied to the hand-cart, but for the 2014 production, the lad charged with the errand instead sits on the truck, holding his precious cargo safely in his lap. Their brief appearance doesn't excuse these objects from receiving regular maintenance. "Each goose has its own muslin sack for storage after the annual run, and the turkey is also swaddled in a wardrobe-grade fabric sheet at the scene shop." reports Maguire, "The turkey has held up pretty well over the years, but it still got a much-needed makeover last year. This season we're working on the geese. They get handled onstage and so take more of a beating. I'd like to give them all a new set of wings—if not right away, then by next year." Asked what the best thing is about working with these barnyard fowl, Maguire chuckles, "Well, we didn't need to hire wranglers for them." 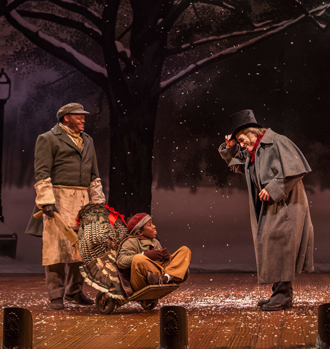 A Christmas Carol runs at the Goodman Theater through December 28.